Unlock the Toy Story in Space Play Set for an all-new journey into the universe. 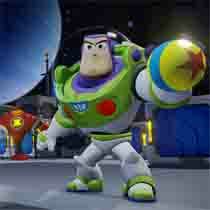 Buzz Lightyear’s Star Command calls for your help to save an alien town from destruction. Take off in this exciting space adventure, but beware of uninvited visitors. It’s up to you to unravel Zurg’s master plan to destroy the planet. Includes Disney Infinity Figures for Buzz Lightyear and Jessie. Additional Play Set characters sold separately. 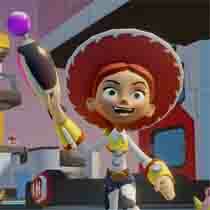 Gameplay and functionality for the Toy Story in Space Play Set varies across consoles. Unlock the Toy Story in Space Play Set and play up to 2-player local co-op. Bring unlocked toys from the Play Set into your Toy Box through a variety of ways, including collecting capsules, earning spins, finding Disney Infinity Character Chests, or accessing the Disney Infinity Avatar Vault. Unlock the Toy Story in Space Play Set and play in single player mode. Bring unlocked toys from the Play Set into your Toy Box through a variety of ways, including collecting capsules, earning spins, finding Disney Infinity Character Chests, or accessing the Disney Infinity Avatar Vault. Unlock the Goo Valley Gameboard and the Arena Battle (Goo Valley) mini game. Play up to 2-player local co-op.